If you want the best travel headphones, you will want to choose a pair that is easy to carry around. You might also want some that are durable enough to carry around in luggage. Since what many people consider to be best headphones for traveling depends on their personal budget, luggage space, and preferences, there are many different options for you to choose from. While traveling around the world there are many different headphones that I have seen travelers wear. From DJ headphones to simple headphones. Everybody has their own needs. This makes the best headphones for traveling a combination of different possibilities. For your reference, here is a list of high-quality headphones from a wide-array of designs and types. There isn’t much worse than sitting on a plane next to the engine. The same goes for hearing a baby crying or being in a hotel or hostel where people are loud during quiet hours. As a result, noise canceling headphones are the prime candidate for the best travel headphones to many. We all need to be by ourselves sometimes. This is one of the main reasons for having noise-cancelling headphones. If you want the best noise canceling travel headphones, one option I would highly recommend is the Bose QuietComfort 25 Acoustic Noise Cancelling Headphones. Unless you have somebody screaming into your ears, these headphones are great for cutting off all background noise. These are also great if you need to get some work done on the go and you need to be by yourself. You can click here to check the prices on Amazon.com. If you want the best in ear travel headphones, you likely don’t want to settle for the cheapest option available. However, you probably don’t want the most expensive option either. If you want to purchase the best travel earbuds a good rule of thumb is to compare the specifications of the products. When you find one you like, decide which one has the most features for the lowest price. For this reason, many people consider the best travel earbuds to be the 1More Triple Driver In-Ear Headphones. Being tuned by a Grammy award winning sound engineer, these headphones have a nice balance of quality and price. They also come with three drivers, a volume remote, microphone, travel case, airline adapter, shirt clip, and extra foam ear tips. This wide array of features and accessories make these a top contender for the best travel earbuds. This pair comes in two different colors, click here to see more information. The best over ear travel headphones really don’t need to cost that much. As stated, what is most important here is that the specifications of the headphones match up to what you need. As a result, the best over ear travel headphones are the Beyerdynamic DT 990 Premium 600 OHM Headphones. This is due to their incredible amount of power, great look, outstanding level of comfort, strong bass, and high-quality audio. If you want to purchase this model but spend a little bit less money there are also designs which come in 250 Ohms and 32 Ohms. These are great for people who are okay with a little less volume (and better eardrums). However, many people like their headphones to be loud. This is why I’ve included this product as the best over ear travel headphones. They also come with a carrying case so that you can keep them safely stored in your backpack. Click here to see the different versions and prices. Anybody who wants for the best travel headphones around $150 should consider purchasing durable headphones that will be able to withstand weight in your bag. This is why the best headphones for traveling in this category are the V-MODA Crossfade LP2 Over-Ear Headphones. These headphones are Kevlar-reinforced along the cables and constructed with steel along the headband. This makes them extremely durable. These headphones are customizable for many different colors and have a considerably high sound quality. Although they have metallic material on around the surface of the product, the ear cups are lined with memory foam padding so that you can still keep your ears comfortable for long periods of time. They are tested to be able to survive over 70 drops on concrete from 6 feet, and the cable can be bent over 1 million times. Keeping these factors in mind, and that they are designed with professional DJs in mind, these headphones are nearly indestructible and affordable. Click here to check the price. There isn’t much of a music listening experience quite like the feel of being live in at a concert and feeling like you are listening to crystal clear music. With the Bose QuietComfort 35 Wireless Headphones – Noise Cancelling, this experience turns into a daily routine. You have surely heard of Bose headphones and/or used them in the past. However, they are regardless the best all around travel headphones simply because of the high-quality sound they provide. They also have a durable protective case to keep them safe. These Bose headphones are noise-cancelling and Bluetooth-ready. This means they can either be wireless or wired. Although they come with a battery, you will not need to purchase new batteries on the go. The included battery is rechargeable and boasts up to 40 hours of battery life. These headphones also have an auto shutdown when you unplug your headphones. They also have a microphone, and remote talk controls. This makes them the most premier pair of headphones available for travel at this price. Check the prices of these Bose headphones here. Choosing the best cheap travel headphones might mean that you go to the store and find the cheapest pair of earbuds available. However, if you want to be a little less frugal and can spend around $30, you can still get a pretty decent pair of headphones for your travels. If you purchase the NRG 3.0 Earbuds you can save a little bit of cash by using a set of earbuds made with wood. However, the material type doesn’t affect the quality of the sound. Wood has commonly been used for musical instruments and products throughout history. Just don’t expect these headphones to have chest-thumping bass or the ability to pump up to high volume levels. The included microphone with voice control, silicon earbuds (in several sizes) and tangle-free wire should be enough to keep you satisfied with your purchase. You can find these headphones on Amazon here. 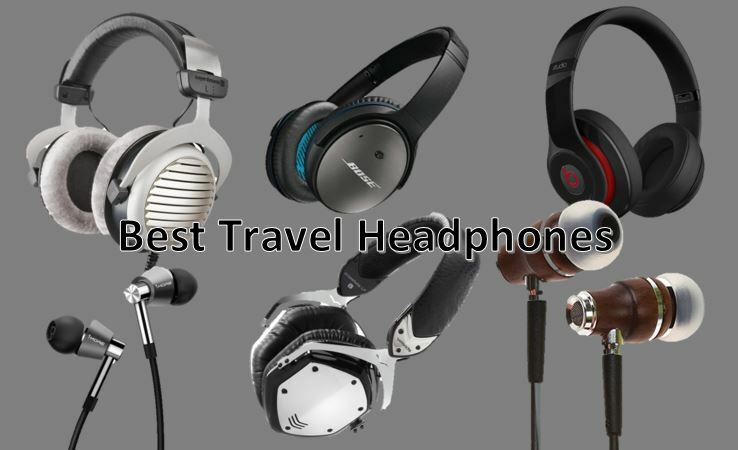 If you are looking for the best travel headphones, first consider what type of headphones you want to purchase. Next, you will need to decide what your budget is and what features you want. If you want the best noise canceling travel headphones, first look at the Bose QuietComfort 25 Acoustic Noise Cancelling Headphones. Anybody looking for the best in ear travel headphones will appreciate the quality of the 1More Triple Driver In-Ear Headphones. The best over ear headphones are the Beyerdynamic DT 990 Premium 600 OHM Headphones for their high-volume and quality. If the best travel headphones under $150 is what you are looking for, the durability of the V-MODA Crossfade LP2 Over-Ear Headphones makes your investment a real steal. Although this option has definitely been presented to you already, the best all around travel headphones are the Bose Wireless Noise Canceling Headphones for their incredible array of features and amazing sound. Lastly, anybody who simply wants the best cheap travel headphones should first check out the NRG 3.0 Earbuds since they offer an incredible price for the features they provide. If you need more travel accessories outside of headphones, check out my Top 10 Best Travel Accessories post. Tagged best headphones for traveling, best travel earbuds, best travel headphones.